An unusual Friday night game for the Five Arches in their top of the table clash against Pendine. The weather remained calm after the previous night's storm. The Five Arches team had to win this game to have any chance of winning the 2nd division championship so all was set for an interesting tussle. In front of an appreciative crowd on rink 2, Ashley and his rink of Dai, Tony and Gwyn were involved in a topsy turvy match against former Five Arches player Dai King Thomas. A strange game with the Arches picking up a count of 7 but dropping counts of 5 and 4, left the game at 23 all with one end to play. Fine play by Dai and Tony and with Ashley keeping well out of the way, the Arches rink picked up two shots to clinch the win. Roy and his rink of Ken, Ken and Ben were on the tricky rink 3 and were involved in another close run affair. The lead changed hands on a number of occasions and there was all to play for on the last end however the Pendine four hung on to record a 17-15 win. Lee and his rink of Eamonn, John and Mike had the classic match of two halves. The first half was close fought with the visitors leading by 2 after 10 ends however the Pendine quartet piled on the pressure after the break picking up 14 shots in a 5 end burst to clinch the game and ran out winners by 29 shots to 12. Out on rink five, Tony with Ben, Clive and last minute substitute Lawrence were involved in an epic battle, neither side managed to open up more than a 3 shot lead and yet another match was decided on the final end.Trailing by 2, the Pendine foursome rallied with some good bowling to pick up 4 shots to win by 18-16. Overall a disappointing result for the Five Arches but congratulations to Pendine, they were worthy winners. We now have a break until our next game, away to St Thomas on Sunday 8th August. 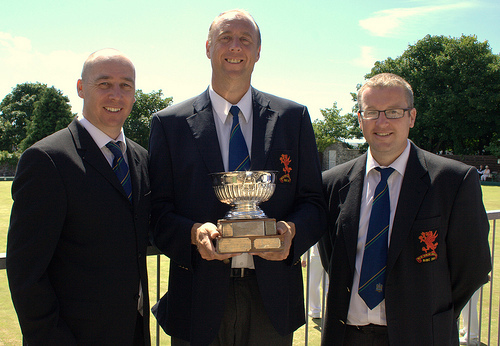 Congratulations to Peter, Andrew and Paul winners of the County Triples 2010. After the victory against Caerleon in the first round of the Carruthers Shield (Welsh Club Championship), the Tenby sponsored Layton and Co solicitors and Chandler Rogers Estate Agents team travelled to Swansea to face one of West Glamorgan’s best teams in Morriston United. This was a stern test in Tenby’s attempt to retain their Welsh Title and many experts throughout Wales had tipped the Swansea team to end the challenge for Tenby. As mentioned last week, Tenby are equally at ease playing away and proved what an accomplished set of players they have become by winning the match with ease by 29 shots. After 5 ends the team pulled away to lead at 5 ends by 18 shots. Further positive play by the Tenby team saw the lead increased to 36 shots at 10 ends. Morriston tried their best to come back into the game, but Tenby would not allow them to reduce the deficit and by 15 ends had a healthy lead of 40 shots. At the 18th end, Tenby still had a big lead by 35 shots and although they fell away during the last 3 ends of the match still recorded a tremendous 29 shot win. Andrew Muskett’s rink started well, leading by 8-2 by the 6th end but fell away in the middle part of the match losing a number of ends to fall 11-15 at the 15th end and with the ‘rinks’ swapping shots finally lost 15-19 at the close. Junior Internationals and former Short Mat World Champions, Luke and Craig Guymer formed once again a great ‘rink’ partnership with the excellent Steve Williams and Luke Rees to take total control against multiple Welsh Indoor Champion, Ken Vaughan. The foursome played with such assurance and no little skill and experience to lead 24-3 after the 14th end. 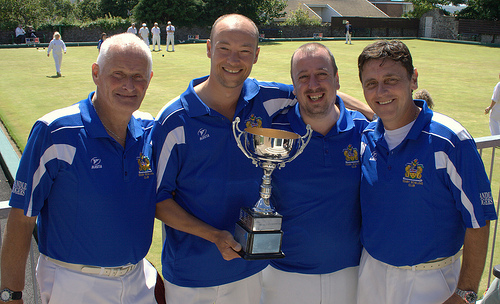 Although Morriston won 6 out of the remaining 7 ends, the damage had already been done. It raised a few questions over the selection committee that such a young rink was put together in such an important game but the selection was well and truly vindicated. I remember being the same age when Ben Owens gave me the same opportunity of skipping for Tenby and I too was a Junior International at the time. There is never a question of experience when you have such a young rink playing together and it has to be remembered that the two back end players are Internationals and have played in bigger games than this. I must praise the rinks application and attitude throughout the match. Paul Diment played ‘third’ to Pat Currie and formed a great ‘back end’ partnership and with the ‘front end’ of Neil Dickinson and John Baggott in great form the rink were never in trouble and at 11ends led 19-4. A dropped count of 5 shots due to no back bowls (John Baggott) drew a sense of respectivity to the score line but the rink still had a great win by 10 shots. Phil Carpenter was involved in a close game but in the end the pressure applied to the Morriston rink showed and a win of 11 shots concluded Tenby’s superiority throughout the match. Joe Richards was superb for the Tenby rink. Tenby went back to the Swansea Indoor Bowling Club for the after match formalities in which the Morriston Captain praised Tenby’s attitude and team performance. Morriston, to reach this stage had defeated former Welsh Club Champions, Victoria and Old Landorians which showed the huge task in which Tenby faced coming into this game. Tenby’s opponents in the last 16 will be Pontrhydfen. The Port Talbot based club is the most successful winners of the Carruthers Shield having won the Shield no less than 7 times. Since 1999, they have won the Club Championship 6 times and been runners up on one occasion, that to last years defeated finalists, Ely Valley by only one shot. Therefore the challenge which faces Tenby is a big one, but the team has the experience and ability to win this game, especially with the game being held at Sutton Street. It is definitely the tie of the round and the winners of this game would be favourites to lift the Carruthers Shield. This weekend, there is a break in the league fixtures due to the County Finals being held in Milford Haven. Tenby did however have a re-arranged mid week game last Wednesday against Neyland at Sutton Street. Due to the fixtures now being ‘backed up’ due to Tenby’s success in the Carruthers Shield, Tenby have to date 3 matches in hand against the league leaders, Whitland, and with the aforementioned club losing their third match in four games, the advantage is with the champions. 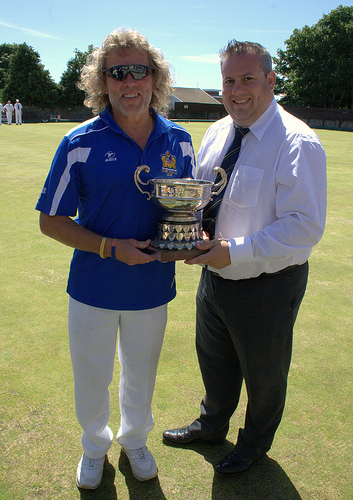 Good luck to the representatives of Tenby Bowling Club on Saturday. The representation as follows: Open Singles: Peter Day vs Phil Carpenter. Pat Currie and Jonathan Webb in the Open Pairs. Open Triples: Gerald Hewitt, Arron Lloyd and Joe Richards vs Peter Day, Andrew Muskett and Paul Diment. Rinks: Mike Jackson, John Baggott, John Roberts and Phil Carpenter. Under 18’s Cameron White.